A fast and user friendly file sharing service is every freelancer’s life saver. File sharing happens everywhere not only in the freelance world. Be it music, videos or document files, everyone appreciates an efficient file sharing service. The following is a discussion of the best sharing applications that I rely on. This is arguably one of the best cloud storage application, with more than 200 million users. Dropbox is a powerful and intuitive tool that provides a clean and easy interface for users. Users can view all shared files in just a click. It supports two step verification processes, hence making it quite secure. In addition to this, mobile dropbox users can easily lock their application using a pass code. It offers a seamless storage and upload through a client software. To sync documents or files to dropbox, just place them in an assigned folder on the client app system, and it will sync silently in the background. In addition to this, you can share other admin functions or links directly from Explorer’s right-click menu. However, you can only share files with specific people through a list of your facebook friends. It has a 2GB free storage with an extra 1.5 GB storage space. With this capacity, users can store and share large files with no worry of space consumption. As mentioned, dropbox is available on both mobile and desktop platforms. On mobile, it supports iOs (iPad, iPhone, iPod touch), Blackberry, Android, Mobile Web, and Kindle Fire while on desktop, it is compatible with Mac, Windows, Linux and Web. There are no size limits for files sent through mobile application or desktop dropbox. 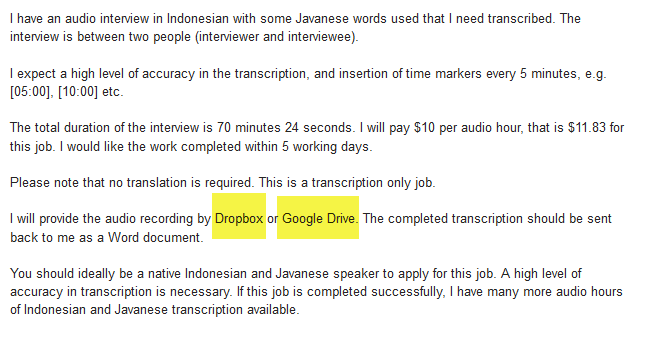 However, the dropbox website only allows up to 10GB of files. Similar to SkyDrive and Dropbox, this application’s desktop client generates a folder for placing files after they are automatically synced to other devices or to the cloud. With Goodgle drive, file sharing cannot be set up through the client desktop, so it only happens through the Drive’s web interface. However, there are options of using the client to distribute a file’s links to Google groups or Contacts. Any document saved in this drive may be opened as Google Docs. It is important to note that any file that you convert into a Google Doc compatible format does not count towards the total storage. Google Drive has a 5GB free storage account, with a maximum file size of 10GB. You may choose to use an additional paid storage space at different rates and plans. The plans include $2.49/month for 25GB, $4.99/month for 100GB up to $799.99/month for 16TB. There are no expiration dates for file storage and only takes average of six minutes to upload a 100MB file. A basic free Box version offers file management strictly through its web interface. Users drag and drop single files to upload. However, if one wishes to upload a whole file hierarchy, there is a java-based bulk up loader that makes this possible. Box maintains a list of items that are recently updated, and it is possible to create a discussion thread for files and folders. It is also possible to automatically distribute public file links through email, social media or contact lists. Box has a free 5GB account storage. Originally known as SkyDrive, One Drive is a file storage and hosting system that enables users to upload or sync documents and files to a cloud store, which they can later access from their local device or Web browser. One Drive allows you to share files with contacts, make files public, or keep them private. Besides personal cloud storage, there is One Drive business storage for businesses. It offers a free storage of 7GB for new users, for the first year, with an additional free storage of 3GB for students. However, there is an additional storage for purchase. The beauty of this service is that through its modern “wave 4”, it contains Office Web Apps that allows you to create, edit, share and upload Microsoft Office Documents through a web browser. This upgrade also allows multiple users to concurrently co-author Excel through the web browser. You can also use the desktop application to concurrently edit similar sections of Microsoft Office documents stored on One drive. It synchronizes changes after you save the documents, but also gives you the selection to decide which version to keep. It allows users to view ODF (Open Document Format), PDF (Portable Document Format), XML based files and Corel’s WordPerfect. This service allows one to send files of up to 2GB to other users, through their email addresses. The sender can add as many files as possible, as long as none of the files exceeds the 2GB limit. To send files, you enter the files you wish to send, your email address, the recipient’s email address and click on “add files”. An upload window will open to allow you to browse your hard drive and search for files to send. When done, the application uploads files from the hard drive to Wetransfer.com, after which you receive a confirmation mail, and the recipient receives a download link.